It’s been awhile since I’ve done a Color Spotlight and there are so many color that I want to focus and highlight that I’m going to get back to doing the feature regularly. 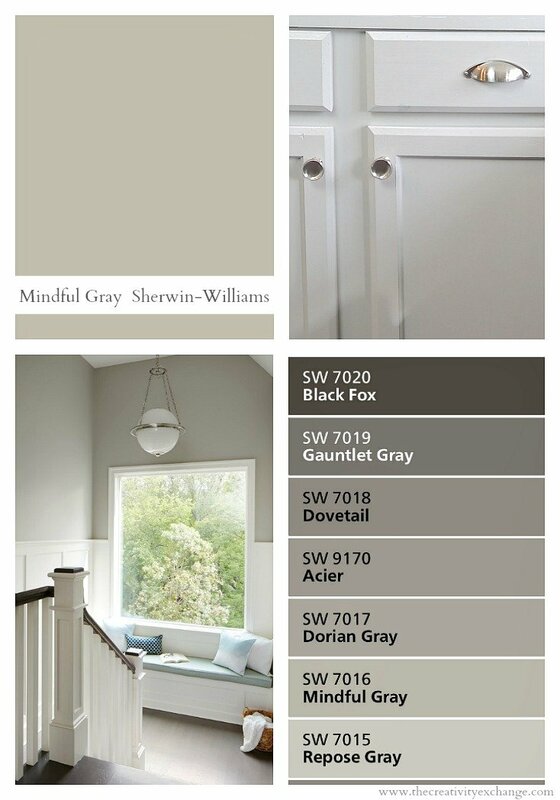 Today, I wanted to to a highlight one of the most versatile paint colors out there, Sherwin-Williams Mindful Gray. Mindful Gray is a near perfect greige color with a beautiful mix of warm gray that is about is neutral as you can get. There are no strong undertones whatsoever like mauve, peach or green as you often see with similar colors. 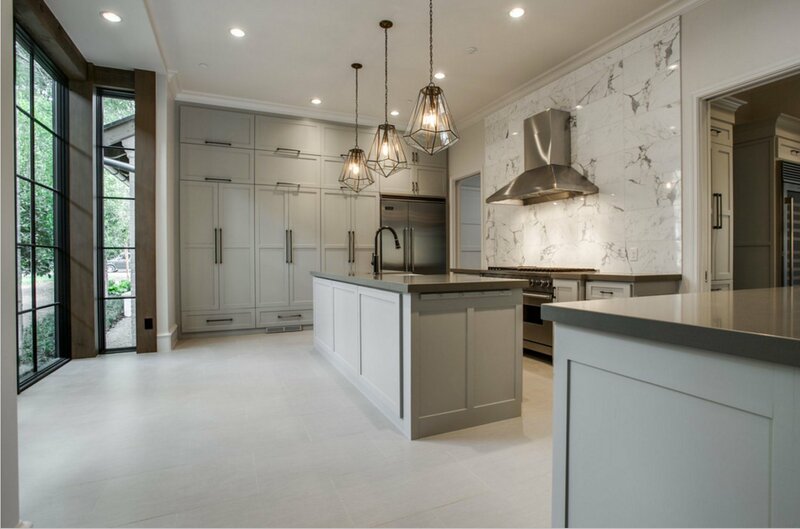 In my book, there is hands down, no better cabinetry paint color than Mindful Gray because it’s a dark enough shade for contrast, the color is absolutely stunning and it will work beautifully with any color combination because of it’s transitional (warm/cool) base. 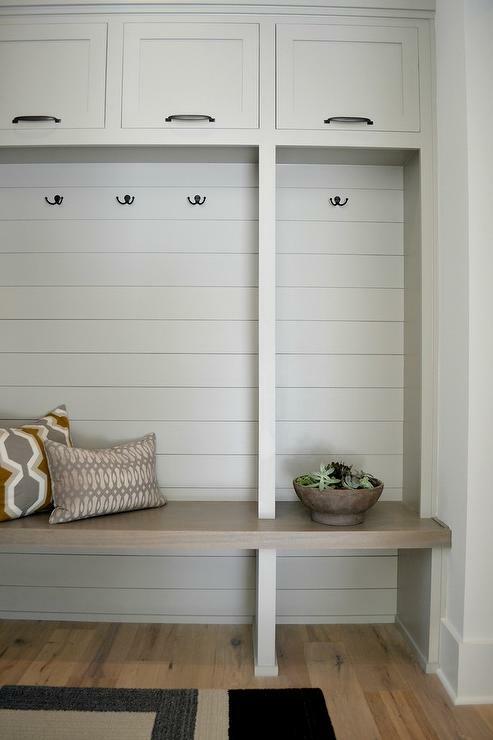 I use Mindful Gray on all my cabinetry throughout my home and I also recommend it more than any other cabinet color for my clients because it always looks amazing and it’s really the most dependable cabinetry color out there. 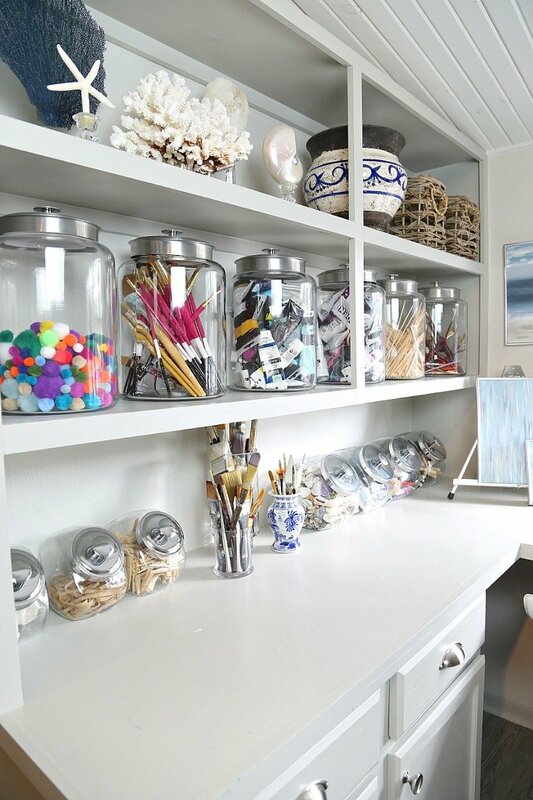 I used Mindful Gray on all the cabinetry and built-ins in my craft room (Repose Gray is on the wall). I also used Mindful Gray on my built-in buffet in my dining room. 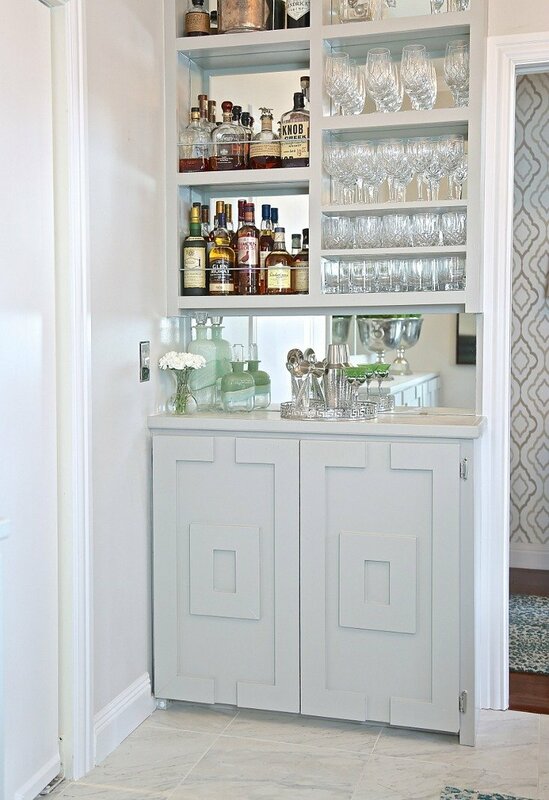 We used it also on our built-in bar, also in the dining room. If Mindful Gray looks familiar to a lot of you, it’s because it’s one shade down on the same paint color card as Repose Gray. 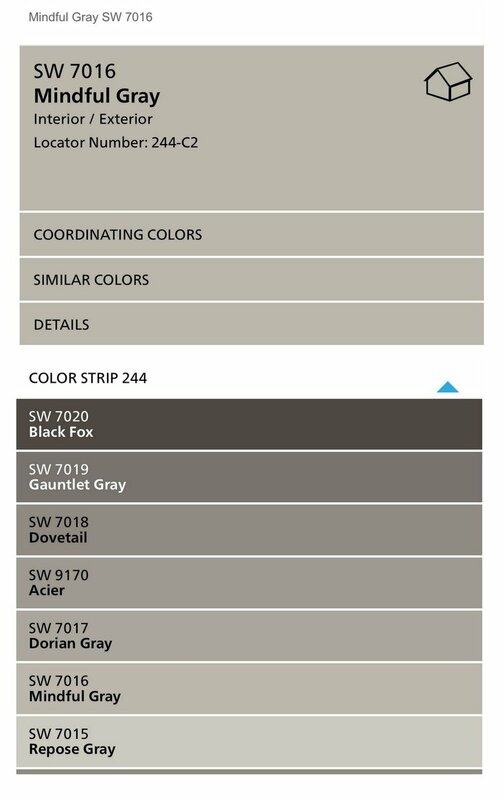 In fact, this whole color card is probably the best card when it comes to paint because all of the colors are near perfection and include rock star colors like; Sherwin-Williams Eider White, Repose Gray, Mindful Gray, Dorian Gray, Gauntlet Gray and Black Fox. The Sherwin-Williams color strip number is 244. 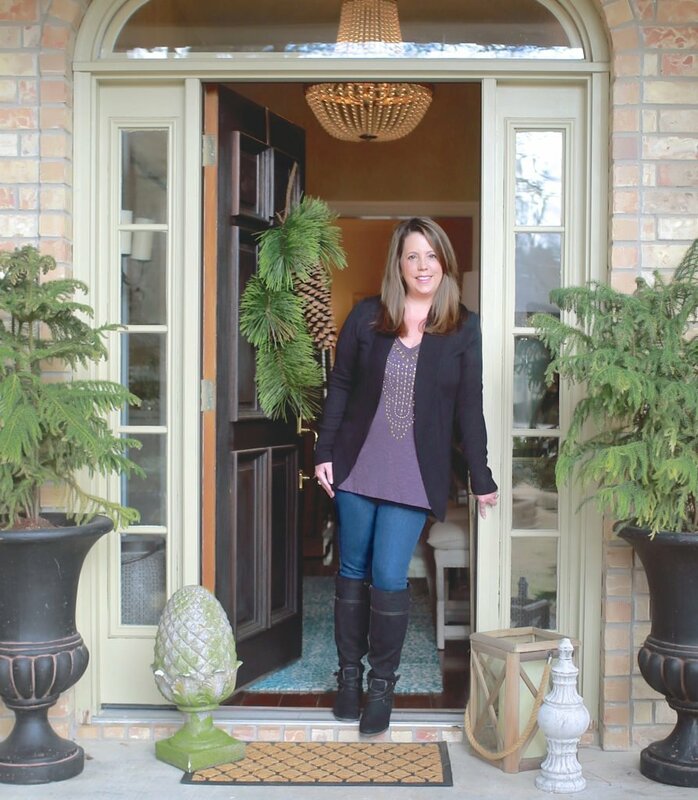 Mindful Gray is also an all-around great color on walls, exterior homes and trim work. However, on walls, it is a rich darker color. Not super dark but if you want a rich greige, Mindful Gray is for sure a color to sample. Let me show you some examples. via Mark Williams Design Assoc. 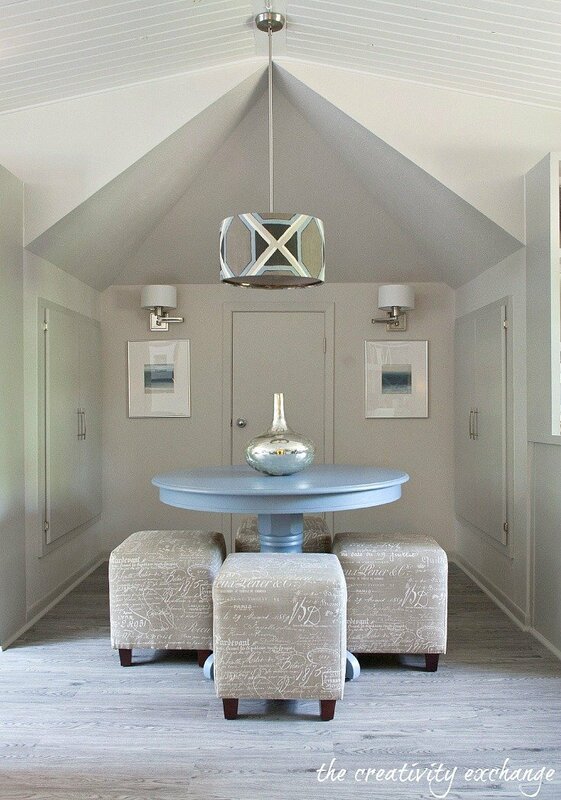 In spaces with less natural light, you can see, Mindful Gray is a more den-like rich color. Of course, it’s still a perfect warm gray but just a little darker. At evening or dusk, with no natural light, Mindful Gray will look like this. 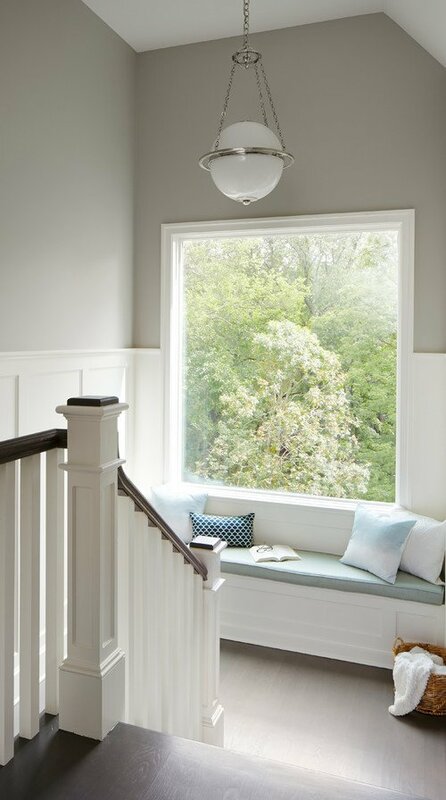 If you’re looking for a wall color that is just a little lighter, Sherwin-Williams Repose Gray is the next color up on the color card and it’s one of the best colors out there and you can see my Color Spotlight here highlighting Repose Gray. As with all paint colors, it’s always best to paint a poster board in the color and tape it to the wall (or cabinetry) to see how it looks and it it’s perfect for your space. 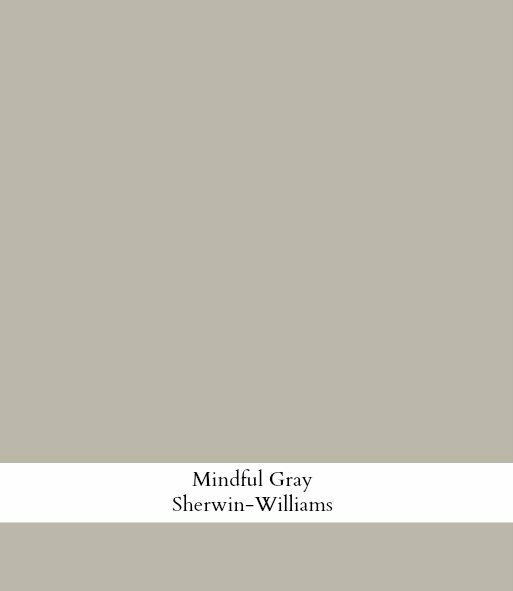 You’ll love both Sherwin-Williams Mindful an Repose Grays! If you want to look back at some of my past color spotlights, you can find them here. What colors have you guys been loving lately? I would love to know and maybe feature on upcoming Color Spotlights! I wish you would do a similar post on wall to wall carpeting. Other than the walls the floor is the next biggest space for those of us without wood or tile floors. Carpeting is expensive so we will live with our choice for many years as you can’t change it like paint! Love these grays as well. What trim color do you think works best with this color card? 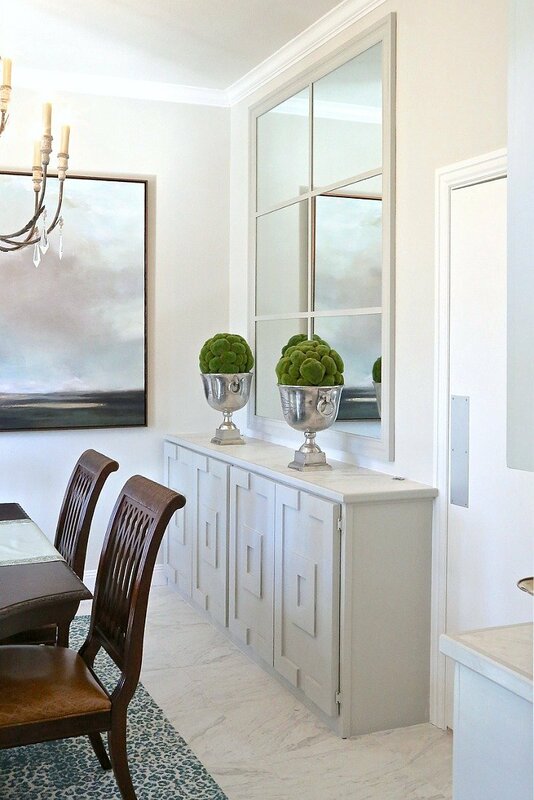 Benjamin Moore Decorator’s White is what I always recommend for my clients. It’s especially beautiful with the colors on this strip. Thanks for your note Terry! My home has all wood trim, in a mid tone wood stain. Would these colors work well against wood, not painted, trim? Love all your posts! I painted my house repose gray and just bought a gallon of chantilly lace for trim and cabinetry. Do you think it will go well with repose gray? I do not have a ton of natural light. I only have 1-2 small windows in each room and they are all tinted. Thank you!! Yes, mindful one of my favorites!!! Truly a beautiful, airy neutral!!! Love it. 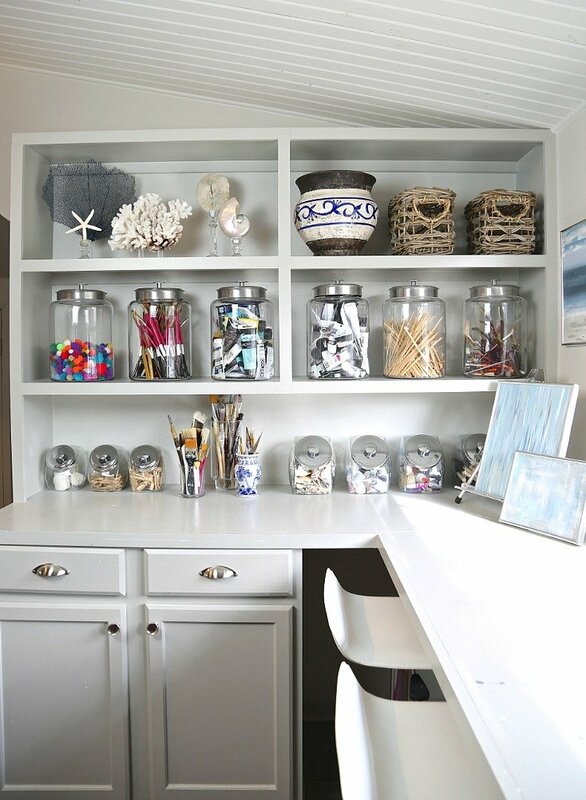 Makes decorating a no brainer! What are your thoughts on pairing Mindful Gray or Repose Gray with BM White Dove? I am loving these neutral grays, but would like a more warm white on my cabinets and trim. Thanks so much for any and all advice, your website has been an invaluable in building and designing our new home! How would Mindful Gray work as a wall color with taupe/tan countertops? Considering gray is a neutral, it would work well with any color. Hello! Will like to know what ceiling paint works best with this paint(mindful gray)? thanks! Great article !! Due to limited funds I painted my kitchen cabinets 17 years ago. I love the results and they have held up beautifuly but it is time for a change in color scheme. I have been researching greys. I have stainless appliances and an earthy black matte counter top. I don’t want the risk of it looking too modern. I love earthy shades. The flooring is going to be black stone wood planks which encompasses taupe hues , grey and black. My dilemma is 1- not pulling pink/blue or green undertones and 2 – without a lot of natural light would it be too dark with the flooring. I am also adding white subway tiles as a backsplash. I would love your input. Wondering what you went with. My kitchen has those colors and I have mindful gray cabinets and still love them after years of having them. I am painting my cabinets mindful grey and need assistance picking out wall and ceiling trim color. 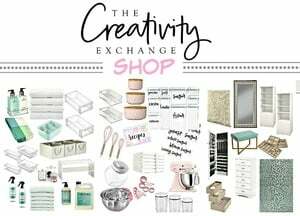 What white paints coordinate with mindful grey? I’ve tested several grays for my sunroon and decided I really can’t live with anything lighter than SW Dovetail. I already have room painted BM’s Kendall Charcoal, Chelsea Gray and Amherst. I have tried pale walls in the past but always went back to the dark side. What do you think about these colors together? Did you go with this color combo? I’m thinking the same for cabinets (Mindful Gray) and walls (Repose Gray) in my master bathroom and would love to see what it looks like! 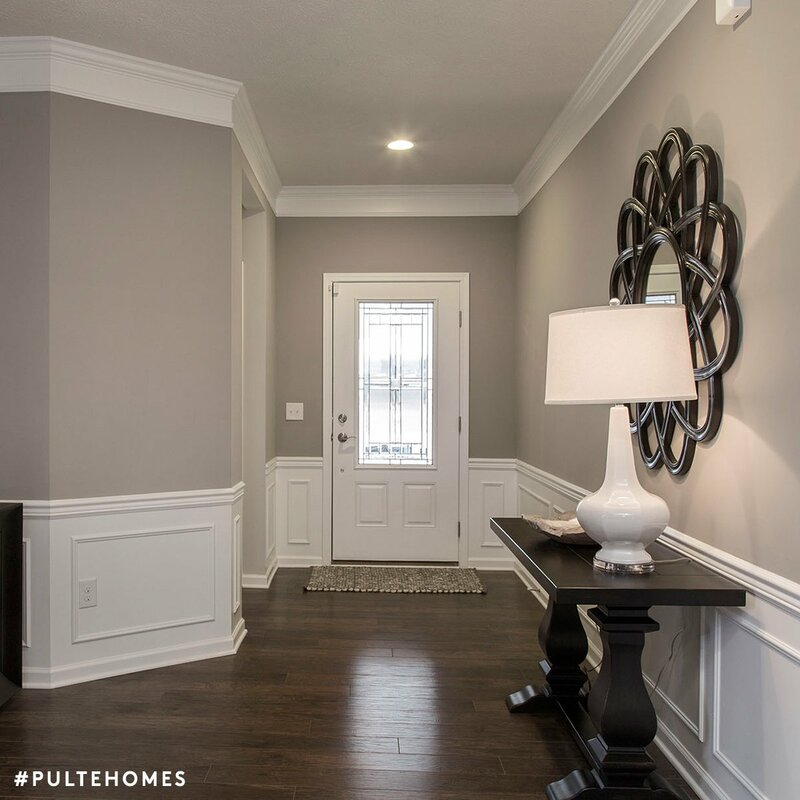 In the pulse homes what is the light color on trim?!? I don’t know what color to match mindful gray walls!!! 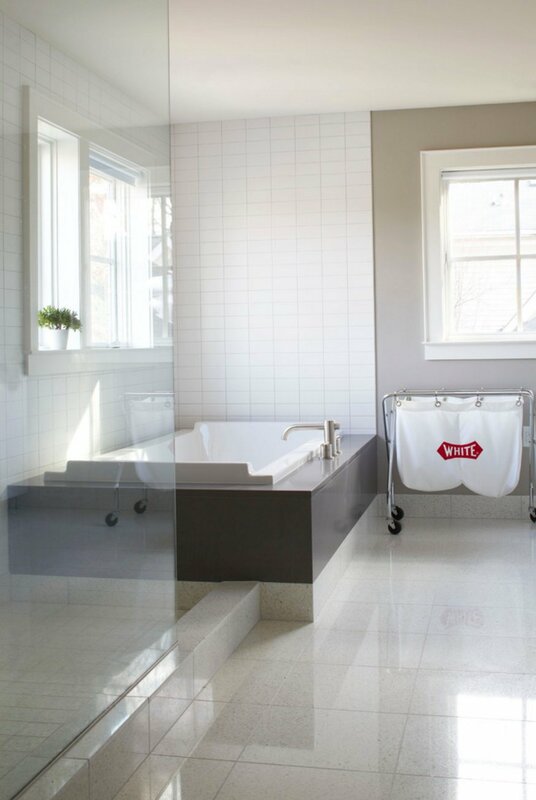 In a very small bath, is Repose Gray too close in color if I paint cabinets Mindful Gray and Decorators White trim? In a very small bath, is Repose Gray on walls too close in color if I paint cabinets Mindful Gray and Decorators White trim? There is no natural light in this bath. My small bath with Mindful Gray on cabinets and Elder White walls turned out beautiful.. I used Dorian Gray in the bedroom, but was a little too dark, so SW added a quart of white to lighten the Dorian, and it is absolutely beautiful. Thank you! I LOVE everything about your posts here!! I’m struggling with wall and trim color from the kitchen throughout our home. What do you think would be a nice color to go against our Dorian Gray kitchen cabinets w/white backsplash? I would love to use a color on our walls that will allow the trim to really POP in white. Thanks!! I bought 6 gal of SW Mindfull Gray after looking at color swatches in my home. Painted a board to see how it would look. Was very satisfied so painted my 30’ x 30’ LR which has an 18’ foot expanse of windows overlooking a lake & 22’ ceilings. Have a taupe, cream muted gray tiled floor. Tons of beautiful natural light. Turns out the Mindful Gray looks slightly blue on my walls? I’m beside myself! Oh no! You must have a lot of natural light in the space, which will cause a gray to lean blue/cooler. If you plan on changing the color but want the Mindful Gray look, you will need to go at least two colors over into a warmer gray. The warmth will balance all that natural light and possible lake reflection. Maybe after a few days you’ll like the color? the cabinet in mindful gray looks stunning is it finished in Semi gloss or satin? My wife doesn’t want something depressing and dreary and i don’t want too light that I might as well have white (lol) any suggestions? What gray can we paint throughout the whole house that still looks like a nice gray Thank you!!! I hate to tell you Chuck but I would strongly encourage you not to do the same color on the ceiling. I’m afraid you will regret not spending the money to have a beautiful crisp flat white contrasting on the ceiling and making your space look larger and taller. Spaces with the same color on walls and ceilings will look a lot smaller than they are. You may be able to get away with it with Repose Gray, since it’s light enough but still, I worry you will really regret not doing it and the look. If it’s a ridiculous amount to paint your ceilings, you could always hire a painter after to come in and paint the ceilings for less money. However, it would be a paint with furniture in place, ect.. Good Luck and keep me posted. Love your posts and pictures. I have just painted my newly remolded master bath in Comfort Grey. Do you have any color suggestions for the Master Bedroom? I will also be adding new carpet in the bedroom which is also a dilemma. The new floor in the master bath is wood-look planked tile in soft greys, grey blue, with the same colors in a pebble tiled shower with a hint of subtle green. Any advice or suggestions would be greatly appreciated. We just purchased a new home and will be painting the entire home. We have a two story great room with a wall of windows so we decided to go with the Mindful Gray throughout with the dining room and office in either Acier or Dovetail. We will be painting all trim, molding and doors the Decorators White, as suggested in this article. We were wondering which white would be recommended for the ceilings? Thank you for your help! Contemplating doing Mindful Gray kitchen cabinets, with Origami White Walls and Extra White trim. Do you feel that would be a solid combo? I have been through many gray paint samples. I want a true gray without blue, purple undertones.. The latest I have tried are Repose and Mindful. Repose is too light and Mindful too dark! Help! If you like the undertones of Repose and Mindful Gray, have the colors mixed together 50/50. If you have the samples of the two colors at home, you can take two tablespoons of Repose and two tablespoons of Mindful and mix them together in a disposable bowl and test. I can’t tell you how many times I have mixed two shades together because my client liked the colors but one was too light and the other was too dark. Keep me posted! Hi, I love your home and photos. What are your thoughts on Agreeable Gray? I have a new home with cream colored trim and interior doors and someone recommended Agreeable Gray to go with cream trim. thanks! Hi Victoria. What color did you choose for your walls with cream trim? 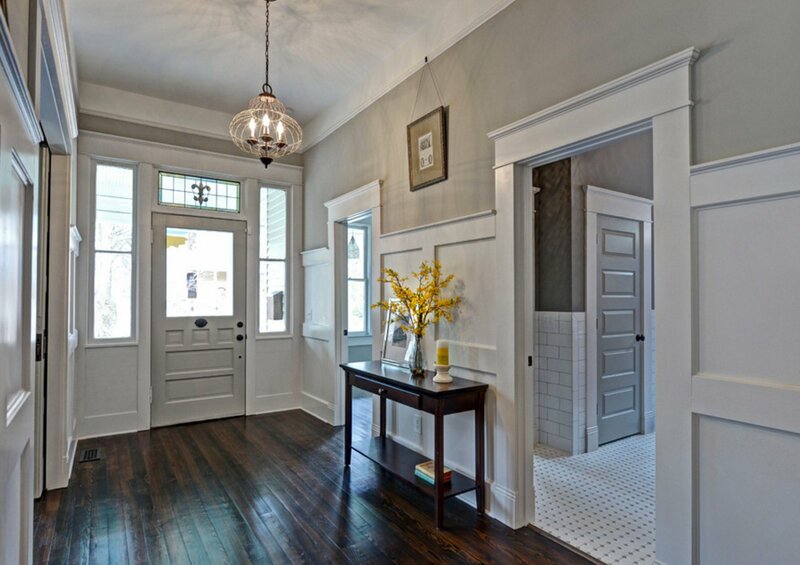 I have antique white trim and was wondering what color would look good with it. Any suggestions would be great! I just painted my kitchen island Mindful Gray, It is so gorgeous! In my house, Mindful Gray reads a tiny bit greenish, but I like it that way. The surrounding cabinets, trim and fireplace were painted BM Chantilly Lace; the ceiling is BM Super White. I considered Repose Gray for the walls, but when testing, it seemed too cool on my walls. I wanted a very pale taupe gray , so went with BM Balboa Mist. 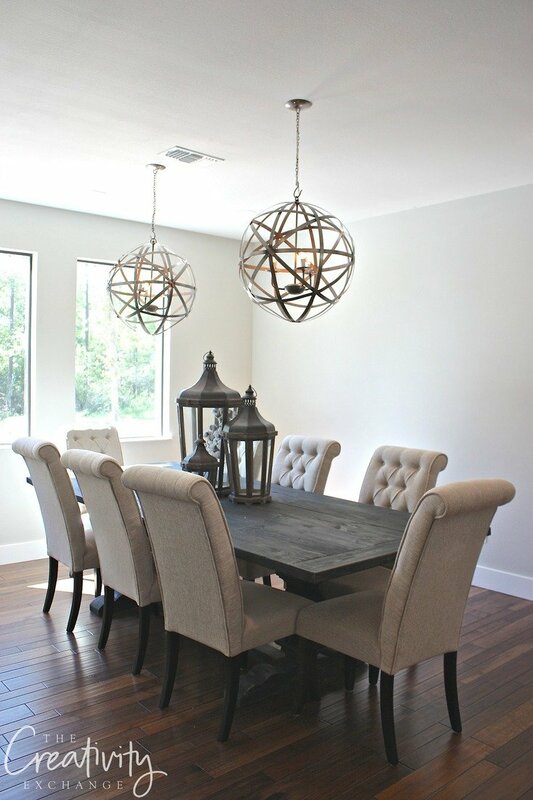 My white oak floor was refinished with a darkish gray fumed finish and all is perfect together. I couldn’t be happier! Hi there! I love this blog. Such great info. I have a very small (5′ x 4′) master bathroom and am trying to decide between Repose or Mindful. I feel like the Repose is a little too light but afraid Mindful will be too dark or make the room look smaller. Any thoughts? Mix the two 50/50, do mindful at 50-75%, or check out Colonnade gray. I have mindful gray on our main floor of the house, colonnade gray on the second floor and repose gray in all of our bathrooms. 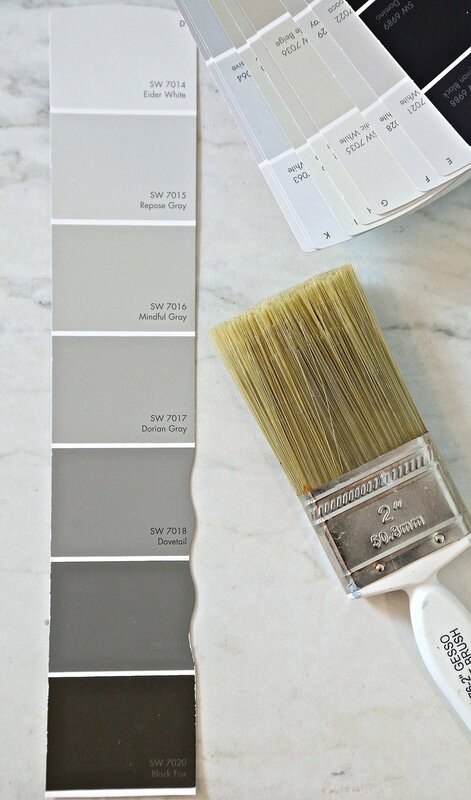 I think that all of those grays are great soothing colors but depending on how much there is sunlight coming into the room, repose gray can look very very light and I’m actually considering changing our master bathroom color to mindful gray to give the walls little bit more definition. There honestly isn’t much of a difference between mindful gray and colonnade gray except the latter one looks a tad more taupe in my view, not much though. Hi there my walls are agreeable grey would an accent wall of mindful grey look good next to it? Your post on Mindful Gray has helped me sooooooo much! I’m considering Collonade Gray SW for my family room with Decorator White BM trim. Any thoughts you have on Collonade Gray? Hi Cyndy… first, thanks so much for your wonderful posts! I really enjoy them. I just had the exterior of my 1949 tiny brick ranch painted in SW Dorian Gray (bright white trim, black shutters, and red door), and absolutely love it. I sort of fell in love with that whole color strip during the process. My living room gets tons of light, mostly from north and west, and has lots of white trim and window treatments so I’m looking for a color with some depth. Your post here with these great pics of SW Mindful Gray are pushing me strongly in that direction. I’m going to get a sample today. I painted my laundry room Mindful gray..love the color BUT, I have no window and flouresent lighting which has give me a Gurple gray laundry room…I am assuming I need a warm bulb or daylight to resolve this problem??? Oh no.. Yes, a warmer or daylight light bulb should help. Strange that you’re getting a “gurple” color.. To me, that tells me that the lightbulb you’re currently is one of those with a purple cast to it. My husband switched out all the lightbulbs in our home one time with those purple ones and all my walls had purple casts! Ugh!! Good luck! I am going to use Mindful Gray in 2 bedrooms. 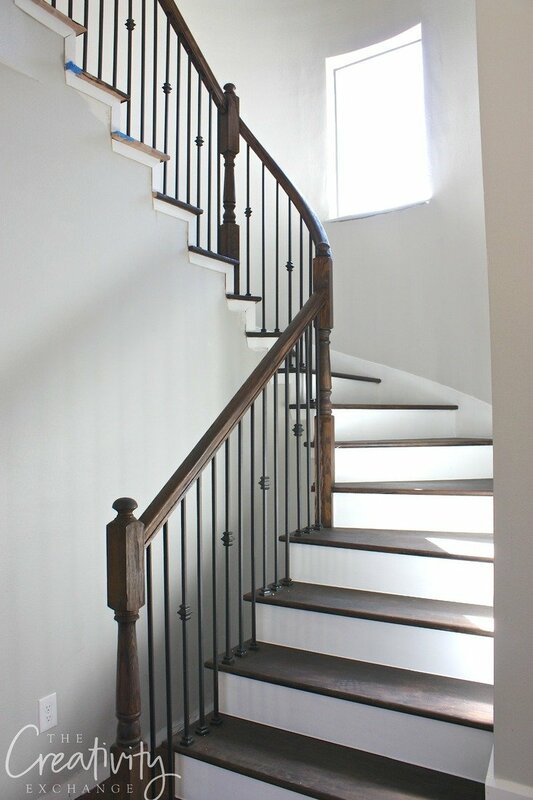 Can you please tell me what type of Sherwin Williams paint you recommend? There are so many varieties! Also, which sheen do your recommend? Hi there! I’m currently building our house and we just picked out our paint colors. There is only moderate natural light and no lighting installed yet. We decided on Mindful Gray for kitchen cabinets and Alabaster for walls, trim, and ceiling. Do you think these will go together? My other choose for walls, trim, and ceiling is Pearly White. Thank you! Hello there, we are currently building a new house, I’m have my island peppercorn my Cabinets white any suggestions on a wall color? we have lots of natural light. Thanks for the write-up! I just bought another home I’m fixing up. I had hardwoods put on most of the main level in Jacobean. Dining room & 2 story foyer get loads of natural light. Living room doesn’t appear to get much light because of the attached screened in porch. The only room we didn’t change floors is the kitchen, because the kitchen is brand new! It is bright & gets great light. Light gray tile floors, stark white cabinets, subway tile in varied shades of gray, and moon white granite (white/gray with big specks of plum). I thought repose gray might work throughout but my husband prefers to bring in more color with mindful gray. What are your thoughts? I love purples & we’re not afraid of color but we we’re leaning towards grays because of what’s already in the home. Do you have suggestions for 1-2 colors that might work throughout? Thanks! HI – we are looking at either Repose or Mindful Gray for our walkout basement. What would be the best color for a coordinating accent wall? Great Article and lovely photos that look nothing like the room I am painting. It’s a very small outdated bathroom I cannot afford to remodel so it has a medium dark varnished vanity with a light beige stone look top. I would say the wood on the vanity falls into the warm red/yellow oak color. The floor tile is a very light cream with sort of a pale gray/green/violet taupe in the grout (it’s hard to pin down the color – looks warm in some light and more taupe at other times) and the wall tile is basic shiny medium tan. AKA Awful and quite the challenge!! There are some warm wicker basket type accents throughout the room. Faucets and hardware are matte silver/chrome in color. All trim is SW Pure White. Really struggling to find the right hue to counteract all the beige and warm hues, so I don’t want to continue it on the wall color but finding it very hard to select a gray that will compliment the room without looking like a 5th wheel. Warm grays look too muddy, cool grays look too blue – others look pink or violet. I don’t know if I should dive in and go dark (the room does have a full size south facing window with bathroom style privacy window glass) or should I stay extremely light which seems boring/milktoast. I am really at a standstill on this one. There is an adjacent hallway that has 2 bedrooms and an office (which I just recently painted BM Silver Chain), the bathroom is the 4th room. So many room coming off a small hall means there is a lot of white trim. The hall and bedroom colors will be the next hurdle so before I go forward with the bathroom color I think I have to consider all the rooms. My BM Silver Chain sample does not do anything in the bathroom. Can you even point me in a direction to begin targeting the hue and depth to consider in samples because I am totally lost and at a standstill. Thank you in advance. My bedroom which is actually 2 rooms was recently painted Mindful grey. I’m looking for colors I should use for the bedding and window treatments . Hello Cyndy! We have dark wood floors throughout our house. Would you recommend Mindful grey kitchen cabinets? If so what would be a great wallcolor? Hi love your article! What will be the Sherwin Williams equivalent of BM decorator’s white? Thank you!